It’s been a great day. The housekeepers came, I finished some chores I’d been avoiding, and I got an email asking if I’d bake something for Teacher Appreciation Day. Well of course! I had an instant excuse to test out a new brownie – something I built using a couple of other brownie recipes. These are great and I can’t wait to serve them. Personally, I like more peanut butter/less cheesecake so I’m going to try another batch using the weird peanut butter ribbons from last week. I’ll let you know how that goes. For now, here’s a great brownie recipe. This makes a 13×9 inch pan which you can cut into whatever size brownies you need. I cut mine into 12 very large brownies. 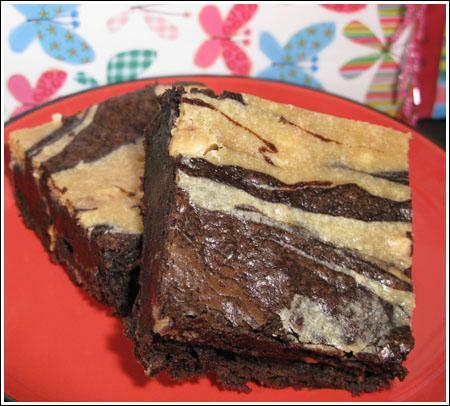 Brownies marbled with a peanut butter flavored cheesecake. Preheat oven to 350 degrees F. (180 C) Line a 13x9 inch pan with non-stick foil or parchment paper. In a medium-sized microwave-safe bowl, melt the butter on high. When butter is melted, stir in the sugar. Return the mixture to the microwave and heat until mixture is very hot but not bubbling (1 minute). Stir well to help dissolve some of the sugar – mixture should appear shiny. Stir in the cocoa, salt, baking powder and vanilla. Add the eggs, beating till smooth; then add the flour and chips, stirring until combined. Spoon 3/4 of the batter into the prepared pan. Prepare peanut butter mixture by beating “Peanut Butter Mixture” ingredients in a bowl until smooth. Drop spoonfuls of peanut butter mixture over brownie batter, then drop remaining brownie batter of peanut butter mixture – not covering it entirely but creating kind of a big speckled pattern. Gently drag a knife through top to create a pretty marbled effect. Bake the brownies for 28 minutes, until a cake tester inserted into the center comes out dry. Remove them from the oven and after 5 minutes, loosen the edges with a table knife. This helps prevent sinking as they cool. Cool completely (and chill for better cutting) then cut and serve. I’m glad you liked those brownies. I gave most of mine away and didn’t get to know them well ;). The base brownie recipe is King Arthur’s “Best Ever Fudge Brownie”. It’s becoming my new favorite too. Okay, I’m totally behind the times in commenting here, but I made these on Saturday and LOVED the recipe. You’re right that the PB flavor isn’t too prominent, but since it’s just a swirl, I didn’t mind the subtlety. And with the very chocolately brownies, I liked the slight twang of cream cheese. Granted, I don’t have tons of experience with homemade brownies, but these are the best ones I’ve ever made! They were the perfect moist, but not underbaked texture, and I liked how thick they were in my 9×13 pan. I also liked that I didn’t have to melt any chocolate or measure out various types of chocolate. I probably should have made the small batch version, but, oh well. Thanks for the awesome recipe! Chocolate, cream cheese & pb…what a great combo—yum! I love peanut butter and chocolate anything!!!! Those “WEIRD” ribbons are not weird! I loved those cookies from last week…I think that is a great invention. I am making this brownie recipe this weekend…I have to bake for a baby shower and a teen retreat. These should work out well!! I am glad you are having a awesome day!! Thanks for this recipe!! The chili looks so good too! I am with you on that one..I make a lot of chili’s but never the same recipe or the same exact way. Great weather for chili! Wow. So you’ve combined my three favorite things. I’m done for! I might give these a try this weekend, and if not, then definitely over my Mardi Gras break. LOL. Yes, that’s a long title. Yum. They look delightful. I think those teachers are very, very, lucky. Pie day! I must celebrate! According to our local paper and the American Pie Council (http://www.piecouncil.org/national.htm) today is National Pie Day. If you miss it, you get another chance on March 14th – National Pi Day. One of our math teachers always had fun celebrating Pi Day.